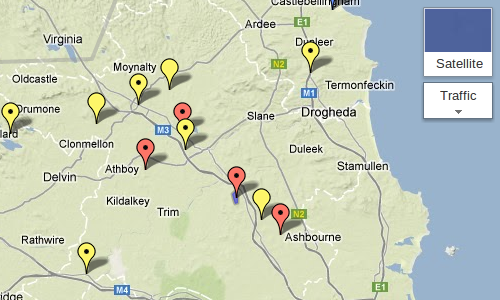 This post aims to collect some online map resources for early medieval Ireland. A knowledge of local geography and toponymy is often indispensable for researching early Irish history and literature, but equally often inaccessible due to changing names and the disappearance of sites. Textbooks generally provide only overview maps. One of the most useful printed resources for ecclesiastical sites that I’m aware of is the Map of Monastic Ireland to c. 1600 compiled by R. N. Hadcock, published originally in 1960 and afterwards included in A. Gwynn and R. N. Hadcock, Medieval Religious Houses: Ireland (Harlow 1970, rev. Dublin 1988). The Archaeological Survey of Ireland series has very detailed maps for individual counties. Neither the Monasticon Hibernicum nor Hogan’s Onomasticon Goedelicum (Dublin 1910), for all their value, give precise locations for sites. I started compiling my own map of early medieval sites on Google Maps in 2007, initially working from James F. Kenney, The Sources for the Early History of Ireland. 1. Ecclesiastical (New York 1929, rev. 1966). I supplemented this from time to time afterwards on an entirely ad hoc basis. Some of the locations are more accurate than others. Many of them can also now be explored in Google Street View, which can give an interesting impression of the surrounding landscape. Around 2002 I downloaded an Access database file from the website heritagedata.ie (now defunct) maintained by Dúchas–The Heritage Service, since partly reconfigured as the National Monuments Service. The dataset contained c. 800 entries with co-ordinate information for national monuments, from prehistoric to early modern, many entries also with historical notes. I’ve added my own rough categorisation using different icons. Data was missing for monuments in Cavan and Laois, and notes were absent for counties from Mayo onwards alphabetically. In the interests of making publicly owned information more accessible, I’ve now transferred this data into Google Maps↦. The OSI has a fantastic collection of maps online since around 2009. These include modern local maps in detail, satellite images from 2005, 2000 and 1995 (often better images than in Google Maps), 6-inch maps from 1825–1846 and more detailed 25-inch maps from around the 1890s. The NMS has a map viewer which appears to list all protected structures. I’ve yet to master the interface. The number of monuments listed is extremely extensive, though there’s often little or no information on them and the search tools seem designed for locating individual monuments rather than exploring the data. Useful resource for Irish- and English-language placenames, with some archival materials. Landed Estates Database↦, currently covering Connacht and Munster, compiled by Marie Boran and Brigit Clesham at NUI Galway. National Inventory of Architectural Heritage↦: interesting information on modern structures. Please feel free to supplement this list in the comments box. you have introduced me to the osi and the national monuments d base thanks for that i see myself spending the winter selfishly getting familar with those go maire tu go raibh maith agat. Delighted to hear it! Enjoy.